Ypsilanti Fire Chief Jon Ichesco supports a larger "functional district" to cover Ann Arbor and Ypsilanti. When a house at 1208 Washtenaw Avenue near the Eastern Michigan University campus in Ypsilanti burned recently, a cell phone call to report the fire was routed to the Ann Arbor Fire Department. That department dispatched trucks to the same address on Washtenaw Avenue in Ann Arbor. By the time the Ann Arbor department discovered the home was in Ypsilanti and alerted the Ypsilanti Fire Department, the house was destroyed. Situations like that highlight how boundaries between the two jurisdictions have complicated firefighting efforts. But fire officials say they hope such situations could be avoided under their plan for a “functional district” to cover both cities. Under the plan, all fire calls would be routed to a central dispatch center, and dispatchers would send the closest trucks to the scene. 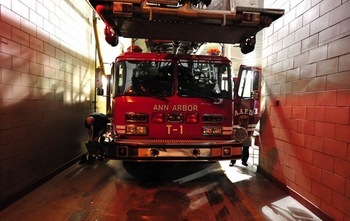 Ann Arbor and Ypsilanti’s fire departments are close to an agreement on creating a "functional district" that would allow them to manage operating procedures together while maintaining their own identities. It's an idea that's been explored for at least two years, but one that's gaining momentum as both departments cut their ranks and look for ways to save money. Ann Arbor and Ypsilanti are both struggling with budget deficits in the millions, and public safety cuts are on the table in both cities. In Ann Arbor, a plan to lay off 14 firefighters was recently postponed for at least six months when the firefighters union agreed to a new contract with 4 percent in wage and pension concessions. In Ypsilanti, the city manager recently presented a plan to cut six positions from the 18-member fire department. Officials from both fire departments say an agreement is nearly ready, and they're hoping to bring it before their respective city councils sometime in the next several months. It's not clear yet whether neighboring townships will opt in, expanding the district beyond the two cities. Officials say safety and efficiency could be improved in such an arrangement and are the motivating factors for pushing forward, despite some opposition. Ann Arbor Assistant Fire Chief Ed Dziubinski agreed. “It’s about more efficient service to the community, and it also balances in with firefighter safety,” he said. While personnel cuts increase the need for collaboration between the two departments, those proposed reductions also jeopardize and complicate efforts to come to an agreement. Dziubinski also said the instability is cause for concern. The idea for a larger fire district currently only includes Ann Arbor and Ypsilanti, but Ichesco said it could be expanded to bring in Pittsfield Township, Ypsilanti Township, Superior Township and Ann Arbor Township if those jurisdictions are interested. But some of the townships appear hesitant because they use an "automatic mutual aid" system, which guarantees assistance from neighboring townships. Under automatic mutual aid pacts, firefighters from more than one department are automatically dispatched to the scene on certain calls, such as reported structure fires. Fire departments also can request mutual aid after arriving at a scene, a practice that officials say has become more commonplace in the last few years as the fire departments have shrunk. Ichesco said some smaller departments have reservations about joining a larger fire district because they don’t want to regularly make trips into the cities when far fewer fires occur in the townships, creating an inequitable arrangement. Ypsilanti and Ann Arbor fire officials say 2009 mutual aid responses between jurisdictions show a larger district wouldn't lead to smaller departments subsidizing larger ones. Superior Township provided mutual aid to Ypsilanti once more than it received it. 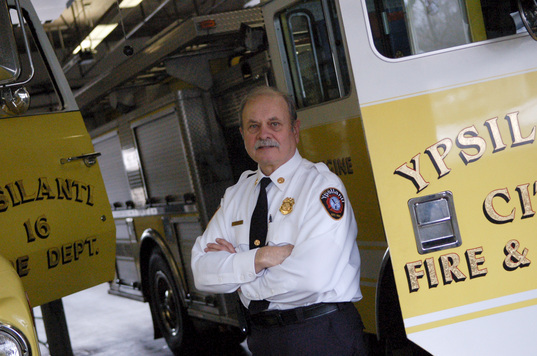 Ypsilanti provided mutual aid to Ypsilanti Township 15 times more than it received it. Ann Arbor provided mutual aid to Ypsilanti two more times than it received it. Ann Arbor Township Fire Chief Rick Ericson remains skeptical. Pittsfield Township Public Safety Director Matt Harshberger was more open to the idea, but said he didn’t want to speak on the matter too much until the next meeting between the chiefs. Dziubinski said the stations that would most benefit in Ann Arbor are Stations 4 and 5, which are in the northeast corner of the city and far away from the other three Ann Arbor stations. Neighboring Ann Arbor Township could be called to assist Station 4 or 5 on calls, but those stations also would respond to township emergencies, Dziubinski said. Ann Arbor's stations are closer than those in Northfield Township, Green Oak Township and Chelsea, which currently send aid to Ann Arbor Township. Officials also point out sending closer units means the departments can meet firefighter safety regulations more quickly, especially the Occupational Safety and Health Administration's “two in, two out” rule. That regulation requires four firefighters on the scene before any can enter a burning building. Once a unit is on the scene, the highest ranking officer in the first arriving unit would be the commander. From there, the command structure would work nearly the same as it does now. Ypsilanti fire officials say equipment consolidation could be another advantage of a "functional district" for fire departments. Ichesco and Dziubinski see another potential advantage in consolidating equipment each department must own. As separate entities, each department needs one of each type of truck, even it’s only used once or twice a year. That same truck may be one another department uses regularly. 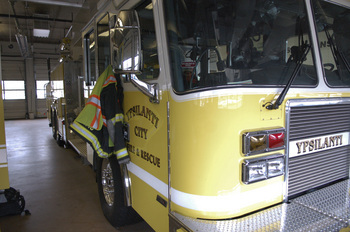 Instead of a department purchasing a $500,000 truck it only uses once a year, the truck used regularly by a neighboring department could be sent when needed. Union support to the plan remains a hurdle. Ypsilanti firefighter Ken Hobbs, the union president, said firefighters were on board at the effort’s outset, but that support has died as they've been excluded from many of the recent talks and negotiations. Hobbs said the unions are no longer welcome at the meetings to discuss forming a functional district, and he was concerned about statements Ypsilanti Mayor Paul Schreiber made at last Monday’s budget meeting. Hobbs said the original document had a clause that precluded further layoffs, but that has since disappeared from the dialogue and documents. He said he now believes the city councils see the district as an opportunity to lay off firefighters because other departments would provide backup. Dziubinski said he recognizes the potential stumbling blocks and wants to work through them as quickly as possible. Schreiber said he believes the nature of firefighting is changing, especially as improvements in fire prevention lead to fewer fire emergencies and more medical runs. He views the prospect of a functional district as a step in the right direction toward an eventual regional fire authority. But he also said he wants to see the current agreement before committing his support. “I’ve said numerous times the functional district is a good idea, and I think everyone on council feels the same,” he said. Tom Perkins is a freelance reporter for AnnArbor.com. Reach the news desk at news@annarbor.com or 734-623-2530.